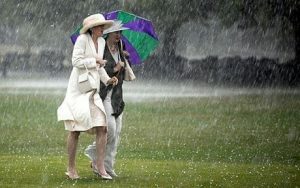 Oscar Wilde once condemned English peoples obsessive discussion of the weather as “the last refuge of the imagination”. If you’re studying at Brighton School of English you may have noticed that discussion about the weather is rife amongst the English people. In recent (2010) research it was discovered that 94% of British people in a survey, admitted to discussing the weather in the past 6 hours. While 38% admitted to talking about the weather in the past 60 minutes. Social anthropologist Kate Fox, described this as meaning “at almost any moment in this country, at least a 3rd of the population is either talking about the weather, has [just] done so or is about to do so”. Britain’s position at the edge of the Atlantic places it at the end of a storm track – relatively narrow zones over oceans that storms travel down, driven by the prevailing winds. “These storms are feeding on the temperature difference from the equator to the pole,” says Douglas Parker, joint Met Office professor of meteorology at the University of Leeds. As the warm and cold air fly towards and over each other, the earth’s rotation creates cyclones – and the UK bears the tail end of them. 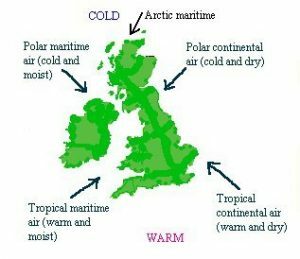 Then there is the Gulf Stream, which makes the British climate milder than it should be, given its northern latitude, and the fact that the UK is made up of islands, meaning there is a lot of moisture in the air. “Water in the atmosphere makes the weather particularly unpredictable,” Parker says. In some situations, weather talk is an icebreaker. In others it’s used to fill awkward silences, or divert the conversation away from uncomfortable topics. Often it’s an excuse for a good old grumble, which can be a bonding experience in itself, but we can also use weather speak to gauge other people’s moods: “Depending on their response to your weather greeting, you can tell if someone is in the mood for a chat, or is feeling grumpy and negative,” says Fox.